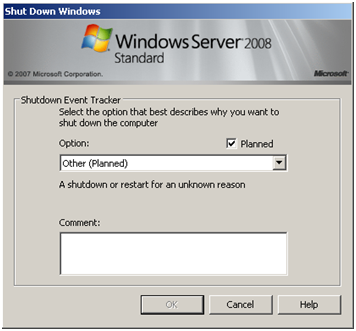 How to disable the Shutdown Event Tracker in Server 2003/2008? A nice feature that can sometimes by annoying is the Shutdown Event Tracker, that allows you to comment every time you shut off a server. While I do understand the auditing requirements to have this in place on production server, this feature is unnecessary for development and test servers and can be disabled. 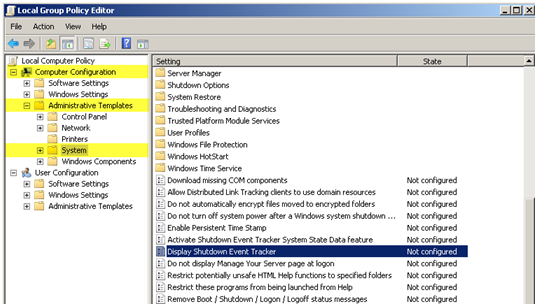 From the navigation menu on the left side navigate to "Computer Configuration > Administrative Templates > System", then on the right side double click "Display Shutdown Event Tracker"
Change the option from "Not Configured" to "Disabled" > Press "Apply" then press "OK". 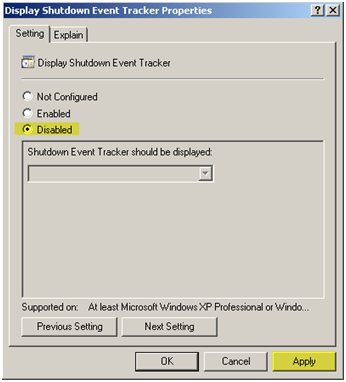 Note you can also use this to enable Shutdown Event Tracker in Vista although I have no idea why someone would want to do that. A restart is not required for this change to take effect. This entry was posted on Wednesday, January 20th, 2010 at 6:56 am and is filed under Windows 2003, Windows 2008. You can follow any responses to this entry through the RSS 2.0 feed. You can leave a response, or trackback from your own site. You had to add it. Right click ‘add..’, the ‘add’ again, navigate to file ‘system.adm’. Then system will appear.